Sarah Peroutka Studio: "Paradise Found"
I recently enjoyed the movie "Modigliani," again. Some reviewed it as the worst movie ever, but I loved it. 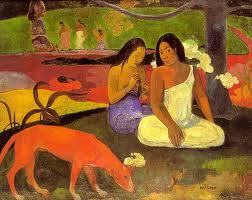 I'll try to see this Gauguin movie, on your sideways recommendation.